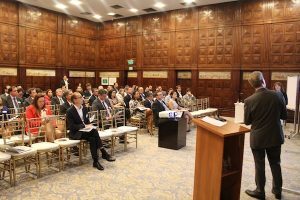 Protection and Indemnity Club Gard hosted an event for members, clients, brokers and service providers in South America at the Copacabana Palace on April 11, 2018. Gard was founded by Norwegian shipowners in Arendal, Norway in 1907, to underwrite only mutual P&I risks of sailing vessels. P&I means protection and indemnity insurance, and is a form of mutual maritime insurance provided by a P&I Club. Today, the Gard Group has 13 offices around the world, and is the largest of 13 P&I Clubs in an international group, with a market share of 17,2 percent. «The trend is that the number of claims is going down, in both frequency and severity. P&I claims are also going down. We see the number of oil spills going down, even though the quantity of oil carried is increasing. Industry cooperation is fundamental. 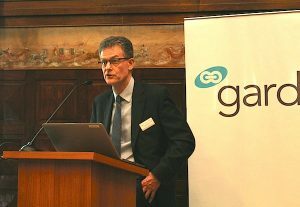 Gard aims to contribute to reducing the footprint of global trade through our daily operations», Mr. Furnes (in the photo above) said. Gard has developed to be a specialized marine insurer with products involving shipbuilding, hull & machinery, energy and offshore. Brazil is and will be a large market for the oil and gas industry, and as a major provider of insurance P&I cover to both Brazilian and to international operators and contractors, Gard expects to be involved in this market, ready to assist its members and provide cover solutions. But Gard is not only present in shipping, but also moving into fish farms, offshore wind, autonomous wind and electronic placing platforms. «We try to help our members to avoid incidents, but if incidents do occur, we have to manage them, minimizing the consequences for shipowner and society», Mr. Furnes said. He also outlined the in-house expertise of Gard around the world. 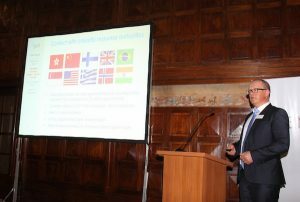 Many of the representatives of the global Gard team were present at the seminar. 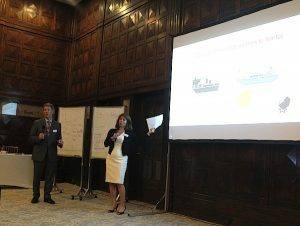 Together, Claudia Santander and Tore Furnes presented the many different Gard services and covers, as they are called, including building, energy-related incidents, different marine covers, P&I covers, charterers liability and others. When it comes to offshore covers, the nature of the operations requires a special cover, known as CGL, in addition to the standard P&I insurance. In this segment, Gard is a global market leader, with a large part of its covered units in Brazil and Gulf of Mexico. Gard has been offering this cover for Mobile Offshore Units since 1973. Another presentation was entitled «Loaded risk – cargo safety and quality issues», a relevant topic to Brazilian stakeholders, according to the speaker, Mr. Nick Platt. He is the Vice President of Claims at the Gard Office in London. «The cargo you carry may represent risk. Dangerous cargo incidents occur despite mandatory codes to manage the risks. According to a recent report from INTERCARGO, fatalities resulting from cargoes liquefying top 100 in the last decade, and this is therefore a global concern», he said. «What happened with iron ore fines and more recently with bauxite: Ship owner organizations including the IG of P&I Clubs, joined forces with major mining and shipping interests in researching the behaviour of those cargoes. We already have new IMSBC Code schedules for iron ore fines and we now have a draft new schedule for bauxite. This is a success story, something Brazilian shippers should take credit for», Mr. Platt said. Misdeclaration by shippers and lack of policing in some countries is a problem. Heat damage to soya beans carried from Brazil to China was also addressed by Mr. Platt. The last presentation focused on offshore and ship claims as multi-faceted incidents. Speakers Frank Gonynor and Claudia Botero-Gotz, both from the Gard New York office, led the interactive session. Two different casualty scenarios were presented, and the exercise showed how Gard identifies and handles claims in a real situation. The seminar was followed by a cocktail for the participants.